After being out for a few weeks I am officially back with one of the most popular dishes from Trinidad and Tobago. 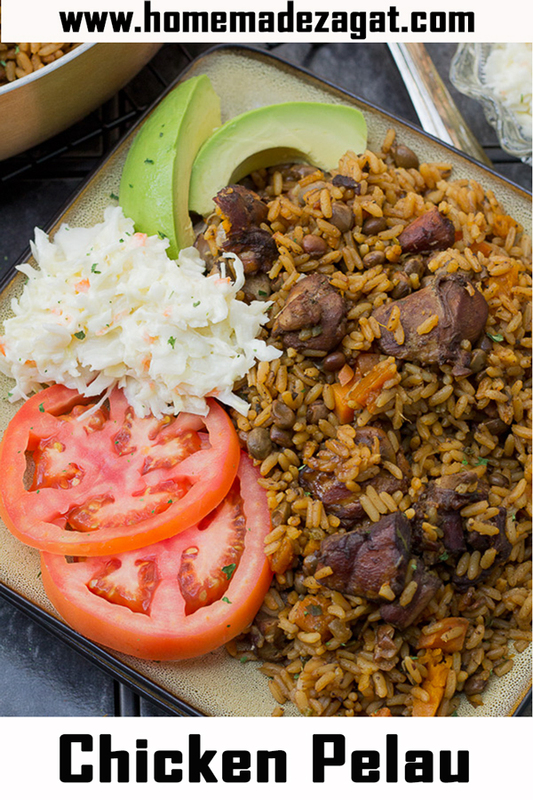 In fact, pelau is unofficially the national dish of Trinidad (Tobago's is crab and dumpling first I feel). 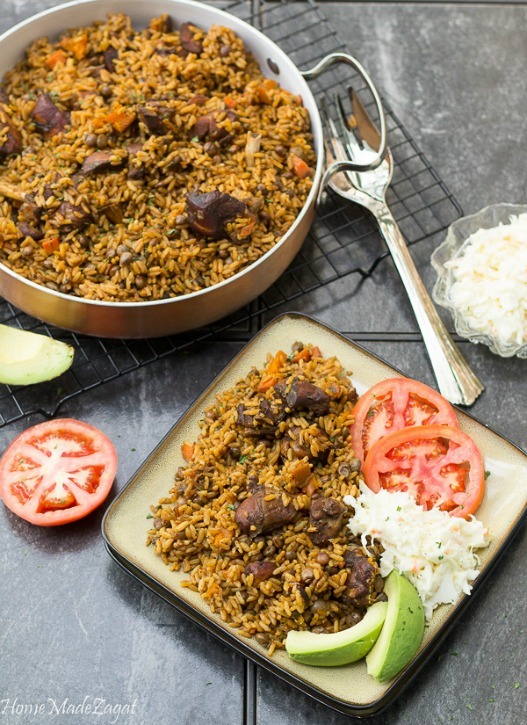 If you are looking for a versatile one pot meal that has rice, pigeon peas and meat then you need to grab this pelau. 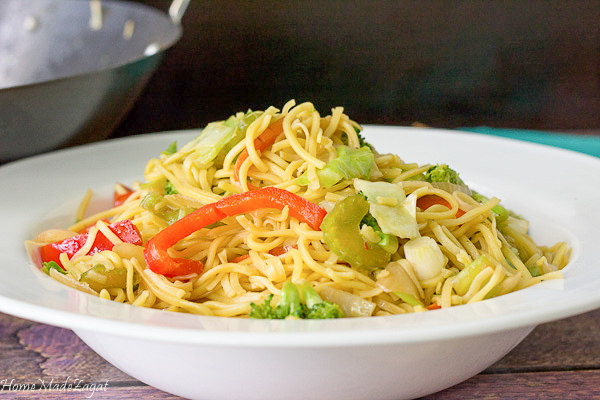 A flavorful meal that is extremely popular to take to beach limes, at parties, at outdoor concerts. I think every West Indian country has it's own "national" dish, officially or unofficially. Or we easily associate a certain dish with an island. Jerk is easily Jamaican. Pepper pot is for Guyana. Fungie is for Antigua and Barbuda. Conch is Bahamian. Crab and dumpling is for Tobago. Well pelau is simply Trini. Ten points for anyone who, seeing this word for the first time, pronounces it right. And another 10 points for someone hearing this pronounced for the first time spells it right. 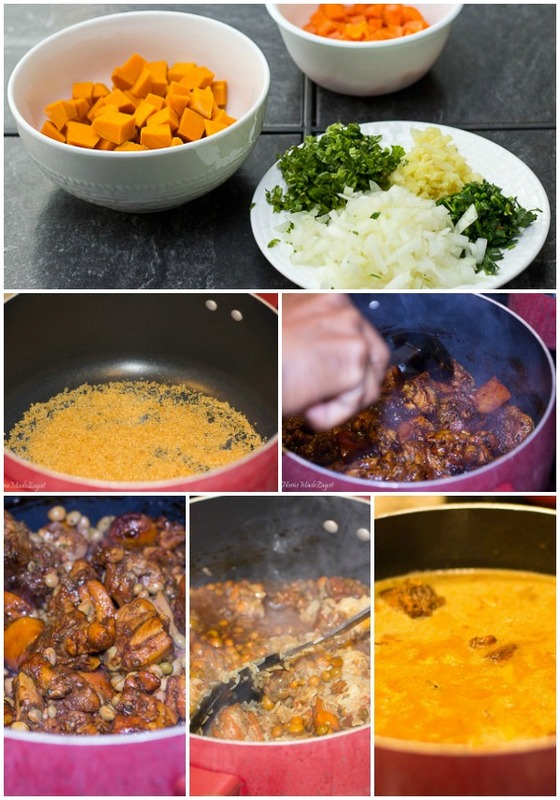 This is a master one pot Caribbean dish. 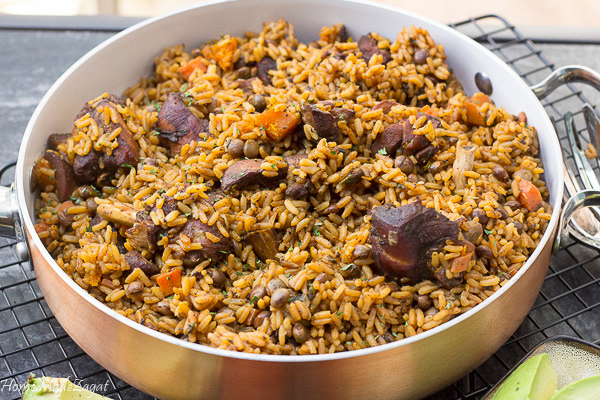 The main meat being chicken (or pigtail or beef) is browned (the same process used to make stewed chicken) and then rice and pigeon peas are added. And eventually, pumpkin, carrots, and coconut milk create a flavorful liquid for the dish to simmer down in. 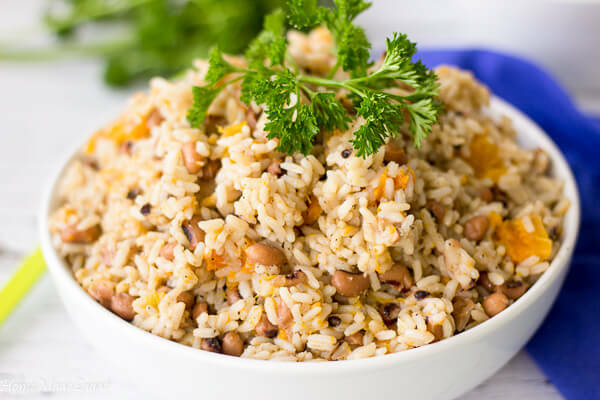 If there is a gathering of people (beach, house party, social event, cricket match) and something quick is needed, pelau is for sure going to be the go-to meal. As kids, heading to the beach my mom was making this, and serving it to us with a side of coleslaw with avocado and tomatoes. After playing in the sun and sand, and ingesting that salt water, a plate ah pelau is what is needed. Heaping spoons of rice and meat being stuffed into mouths, amidst much laughter and plenty ole talk. Additionals include spoons of pepper sauce, sprinkles of ketchup. Then we slurping down some cold coconut water, mauby or cold beers. Random instances of stolen meat from someone else's plate. Great moments and fond memories. This is one of the dishes we refer to as "real trini food" and will always be a part of my menu whether I am at home or abroad. I really encourage you to try this dish. If it's one Trini food you should try let it be pelau. 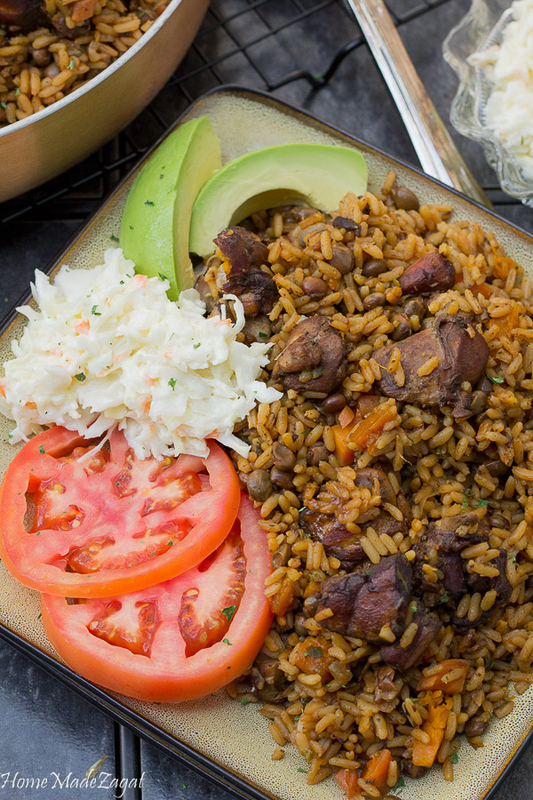 A step by step guide on making the unofficial Trinidad national dish, pelau. 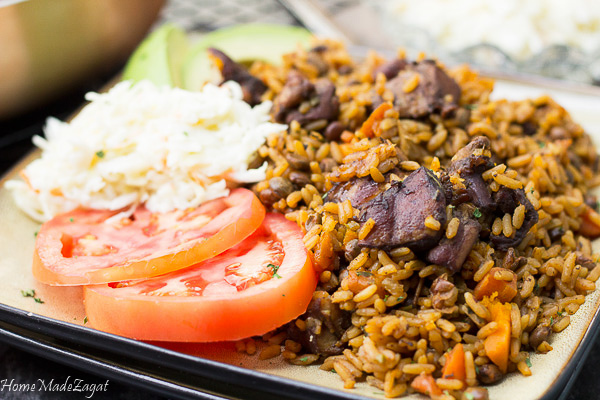 A hearty one pot dish of caramelized chicken with rice and pigeon peas. Wash and clean chicken then season with green seasoning and set aside. Heat a heavy pot and add sugar, sprinkling evenly over the bottom of the pan. Leave sugar to caramelize until all sugar is brown.